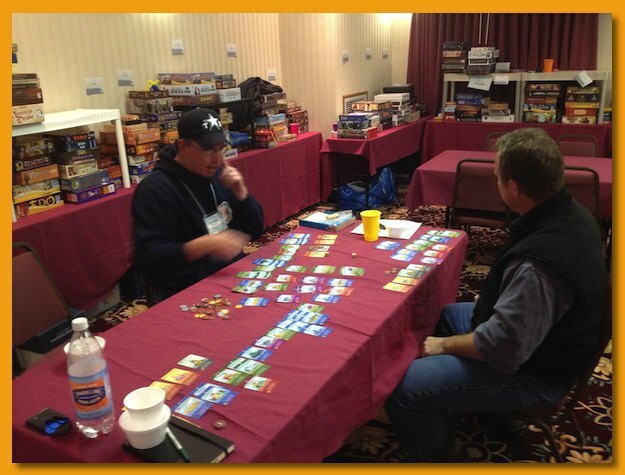 Great Lakes Games 11 has come to a close. I look forward all year to those three solid days of gaming goodness. The time simply flies by and I found myself on Sunday morning wondering where it all went. The hours pass in a blur of cardboard, plastic, baggies, wooden bits, boxes, and cards. Each night I stayed up progressively longer until Sunday morning when 3am rolled around and I needed to head back to my room to get some sleep before the sun came up. This is my fifth GLG and I’ve come to know some people well enough that we even plan ahead of time to meet up to play a game. We only see each other once a year, the games themselves providing only a backdrop for that human interaction. We continue our e-existence, exchanging “likes” and “thumbs” online but I can’t say enough about how GLG provides this much-needed face-to-face time. It’s really a wonderful and rewarding experience. 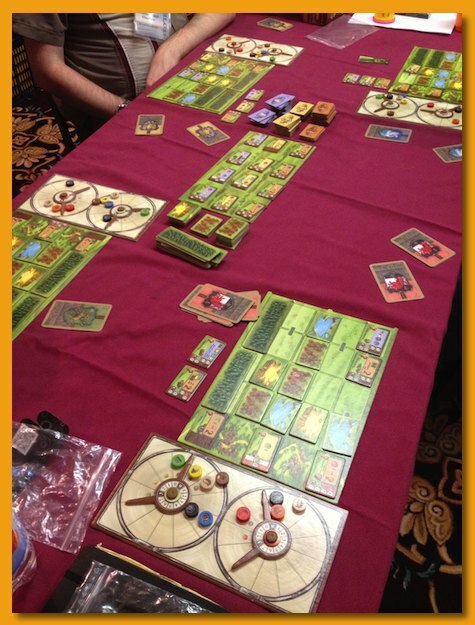 A worker placement card game in the same category as Tournay (imho). Players vie for building a personal realm of cards purchased from a shared 3×3 grid of cards. There is a bit of push your luck as well as engine building trying to get the right cards that work together when activating. Not my cup of tea as I don’t really like games that contain cards with a lot of text and/or iconography. An oldie but a goodie. 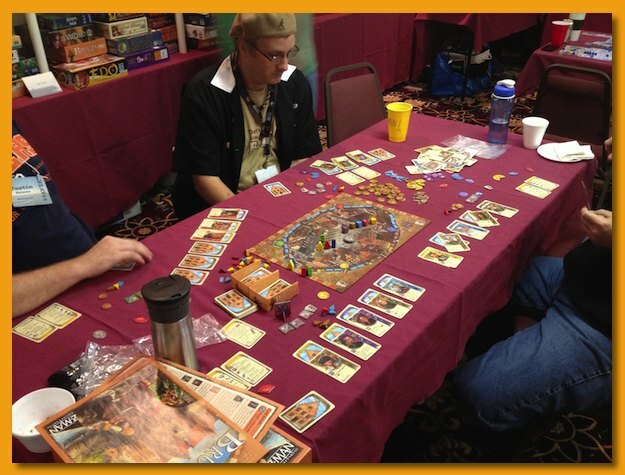 We had five early birds to the con and just wanted to play something until the con really got going. It’s been a while and I really enjoyed it. I’ve played the heck out of my original black copy (named Lexio) but the renamed reprint in white is almost as good. Clacktastic goodness! Yeah, it looks like Booby-Trap but it’s definitely a Euro-game. Players are trying to build three segments of the road using paving stones. The stones are manufactured (not really of course!) when raw materials are placed in the front of the mechanism and then when the player pushes the stick, stuff falls out the other end (and you swap them for the flat stones of the road). When you build part of the road, you get victory points and having build the most in each segment or advanced more quickly to the ends of the segments of the roads earns the player a bonus. It looks cool but the game is rather mechanical lather-rinse-repeat sort of affair that I tired of quickly. One of my favorites of the con. Players use a central hub to choose an action that all players will take. The player that chooses the action gets a bonus (think role selection in Puerto Rico). 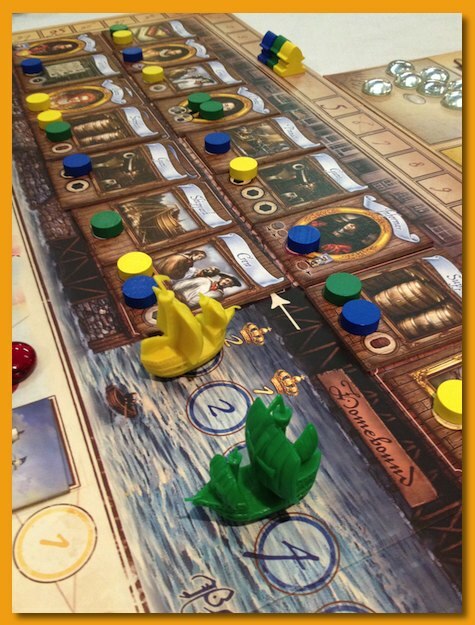 Thematically, players are constructing ships and shipping goods to earn victory points. The variable hub that changes the parameters of the action from turn to turn keeps the game fresh. Looking to pick up a copy of this. A theme-less trick taking game similar to Rage where the player with the lead chooses one of the colors (and therefore the numbered chip) that will be granted to the winner of the trick. There is a trump color but some cards change trump in the middle of the hand and others bomb the trick for everybody. Some other rules are thrown in for good measure but not my cup of tea. A very cute dice/card-based building game where players roll a die (potentially two dice) to activate cards in their city and other players cities earning (and sometimes losing) money. The money can be saved from one turn to the next or used to purchase new cards from the market to place in your city. Nicely done but may quickly become samey. From what I understand, there were very few copies produced in English (a dozen?) so it’s nice to have played it. My first of many Stefan Feld games of the con. 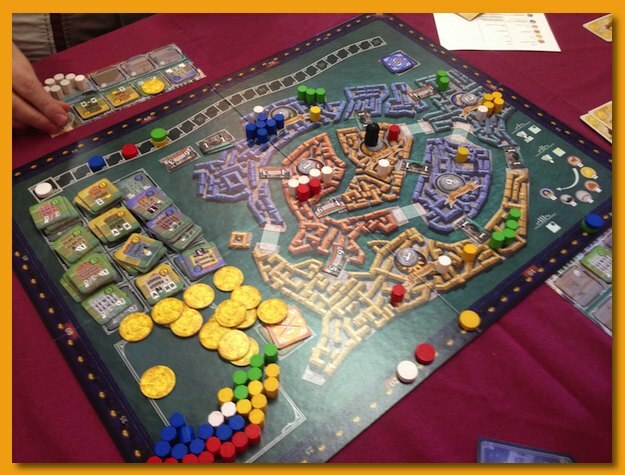 A nicely produced game where players use cards to earn points or spend money to build canals around the city. The traditional Feldian “hit you in the face” feature is that periodically, disasters can trigger bad stuff to happen (e.g. lose all your money) but individual players can work to reduce the likelihood of being affected. Back to back Stefan Feld designs for the win! 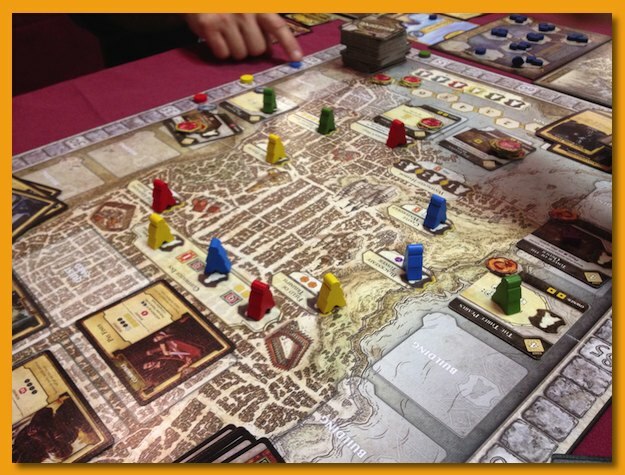 A San Marco-like game but without the down-time of the card split phase. Individual card types allow players to take actions on the board to earn victory points. It has some interesting decisions to make concerning which buildings to purchase and some nifty turn order manipulation options. The Feldian bad-event feature is almost non-existent. Definitely on my buy list. I spoke too soon. Back to back to back Stefan Feld designs for the win! Nobody at our table had played before so we ripped off the shrink and sat down to the rules. Oh…boy. Wow! Don’t do that. Find somebody to teach you. After an hour slog I think we finally got the handle cranking and to our surprise, there’s a really good game in there. In fact, this is the game I pulled on my turn at the GLG prize table and I’m really looking forward to playing again. 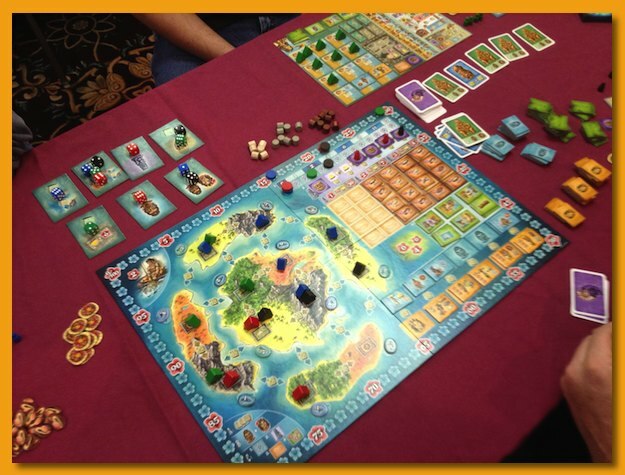 Bora Bora is a Trajan-esque “victory point salad” game of lots of mini-ways to focus on earning victory points. The Feldian bad-event treatment *is* non-existent in this game. I found it a deep and satisfying game. Not much to say here beyond, Dominion rethemed with a board and trains. I’d happily play again but don’t see a need to own it. 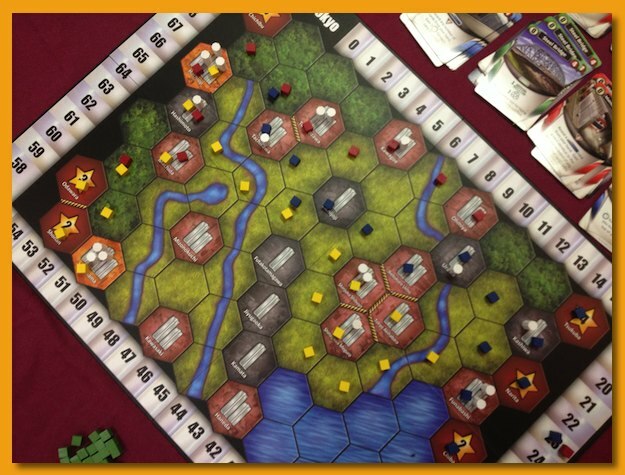 Players use individual boards to track progress in a region where they’re allowed to use it to manufacture the building blocks used to make glass and bricks. Players use identical decks of cards to choose actions they wish to perform. These actions modify the state of their player boards and sometimes produce and/or consume production resources and/or the produced products. Nifty rotating clock-like wheels track the amount of resources and goods available to the player at any one time. Neat little game. I’m trying to decide if I’d need to own a copy or not though. 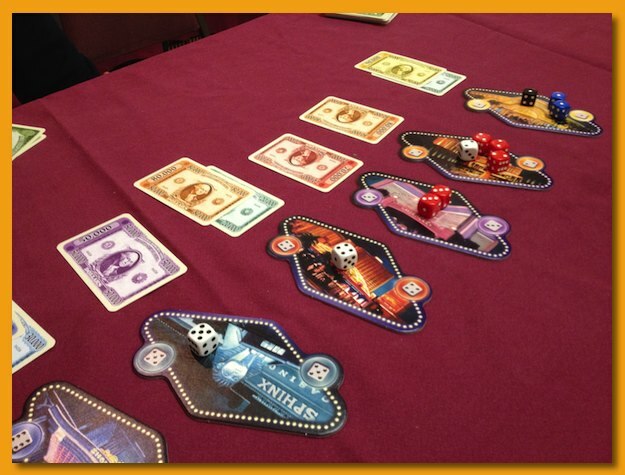 A fun, push-your luck, dice game where players roll dice in hopes of gaining dominance in numbers in one of the six pots of money available each round. Roll your dice and choose a set of numerically matching dice and place them on the matching card. Watch out for the white dice because they have to go too and ties are a push leaving other players the opening they need to swoop in to get your money. 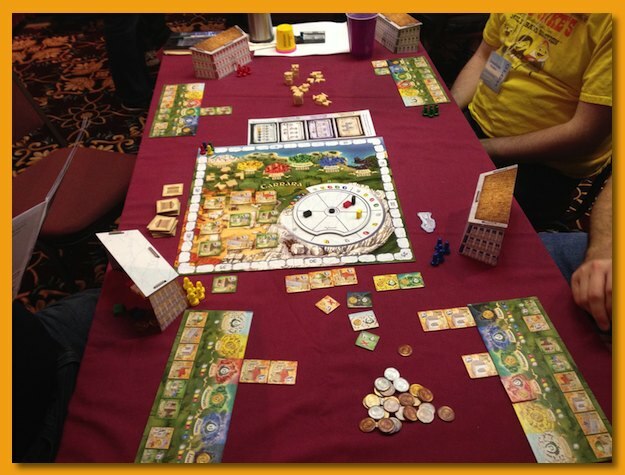 Difficult to find in English, this game pits players against one another in constructing buildings from bricks purchased from a nifty spinning wheel. On your turn you simply choose to construct a building using your previously purchased colored bricks, spinning the wheel one notch clockwise and purchasing one or more bricks, or scoring something for money and/or victory points. Certain colored bricks are needed to build buildings in certain parts of your personal player board. The game is okay but not something I’m looking to acquire. Played this beautifully produced prototype from Jonathan Chaffer. Players take on the role of a film crew attempting to film scenes for a movie studio. Each player is trying to figure out the most efficient way to arrange their set placing different types of cameras and lights and timing the availability of actors to film the scene for victory points. It uses a time-track (think Tinners’ Trail) mechanism to the spatial puzzle but it’s certainly not solitaire. Other players can ruin your best-laid plans by being faster at filming the scene you were trying to film or using the limited actors you needed to film your scene. It’s a neat thematic effort. Well done Jonathan! I wish you luck. Oh what a terrible failure at trying to get another group up to speed on this game. I pride myself on teaching well but this attempt was a strong reminder that my one play wasn’t near enough to solidify the rules. However, one good side-effect of the game is that it did make it clear to me that I don’t like it well enough to put it on my buy list. Okay, now we’re talking. 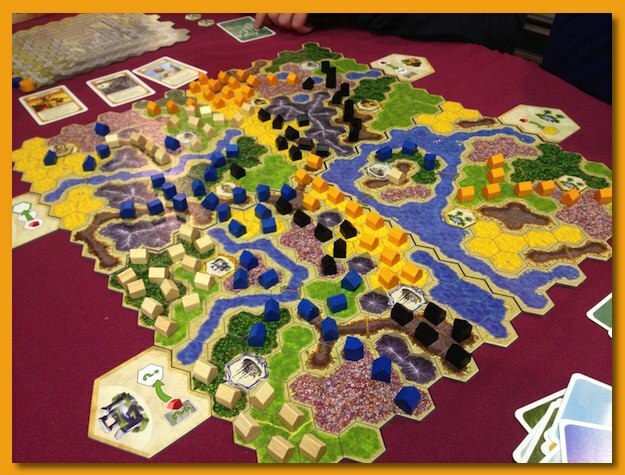 Another Stefan Feld game. Huge box. Pirates hitting you in the scoreboard every round unless you prepare for them. A cube tower. Spatial tile laying. Screwage. 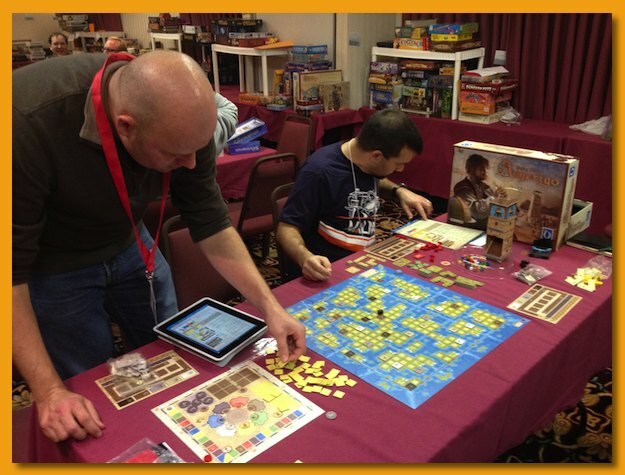 Yeah, Amerigo is a cool game. Must buy for me. I was interested in seeing what playing with three felt like after playing with five and I think I like five better. 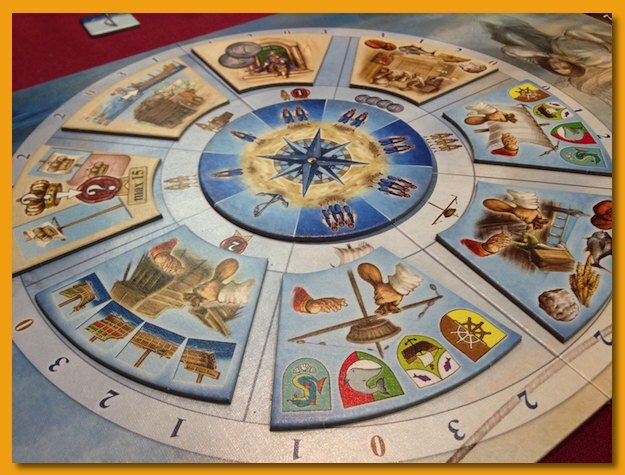 Players use an Egizia-like action selection mechanism to prepare for each of the three voyages. Once everyone has outfitted their ship with cannons, crew, payments for goods, special options etc. the ships set sail and attempt to successfully attack Spanish galleons, fortresses, and towns to gain victory points and other items for victory points. Being first to attach a site is important as well as attacking sites of differing types during the turn. Three independent voyages constitute a game and it’s over before you know it. 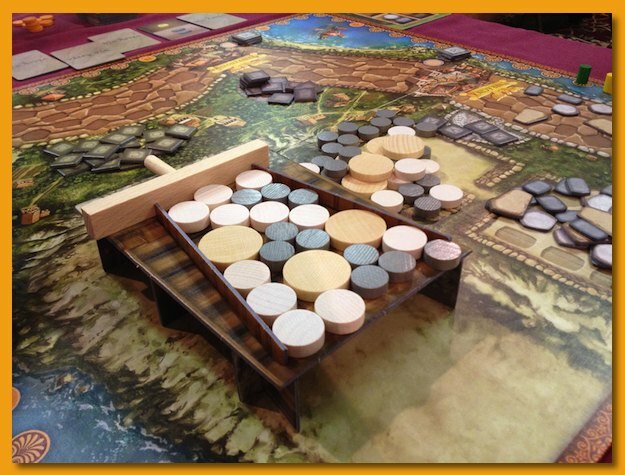 The game looks beautiful and at first blush appears to represent some epic game but in reality it’s really a straight-forward, rather light Euro. I’m a bit worried that the static-nature of vp available on the map will make it feel too same-y. In addition, the market for 3-players felt overly tight. 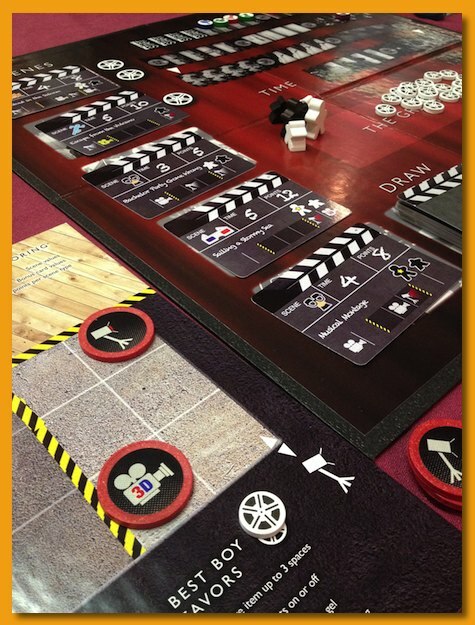 I felt like I had more opportunities to gather needed supplies in the five player game than I felt I did in the three player game. However, I just have to have a copy. It’s just so nice looking. Just a nice way to shut down the evening. Find a friend and play. Nobody has to read any rules and we can just sit, play, talk, and enjoy each other’s company. A perfect game to end the con. Now the post-con blues will set in but I’ve got some CABS events coming up to hold me over for my group’s annual CabinCon 2014 in January!